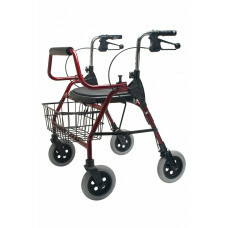 The 4200 series of walking aids come in four versatile models. Made of lightweight aluminum these models are easy to fold and ideal for small spaces. The 4200SWX™ is a heavy duty rollator that supports up to a 500lb/226.8kg weight capacity, yet still fits through most doorways and into cars. It features an oversized 51cm seat for extra comfort and is equipped with ergonomic handles for easy use. With solid 20cm solid tires, it can easily be used by the most vigorous user for those great day to day adventures! Width Between Handles 22 3/4"
Seat Size 20" X 14"
Handle Heights 30 1/2-35 1/2"